I love a good bloody mary. Just the thought of it makes me weak in the knees. I'll even settle for the virgin variety for an afternoon pick me up. Want to know another random fact about me? I always order a bloody mary when flying. Sometimes with a side of vodka, sometimes not, but always with extra ice. Bloody Mary's are kinda like grits. Everyone likes theirs a certain way. I like mine with a blend of additional spices and a variety of green garnishes and my husband likes his with a dab of horseradish. I've yet to find a mix that didn't need a little something extra added. Until now. 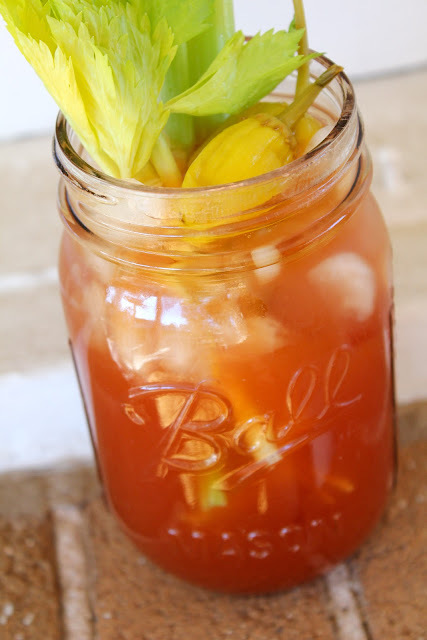 My friends, I introduce you to Zing Zang bloody mary mix. It is perfect. Perfect in every sense of the word. It needs nothing extra. The celery and peppers in this photo are for aesthetic purposes only. If you love this savory cocktail and have yet to try this mixer, you must get some Zing Zang in your life. No, I am not getting paid to say this. It is just that good. I order one too when I fly and mu husband looks at me like Im insane! Good to know! Arent they the best way up there? I'd rather experience that than become member of the mile high club! We could fly together b/c I order the mix, too...sometimes w/ vodka in it. Do you know the place Hog's Breath? They have an excellent bottled mix, too. I always pick up a bottle when I'm in Destin, Fl.